When we’re on the hunt for new properties, we’re looking for parts of the world which people fall in love with. Places which capture the hearts and imagination of those who visit. That’s exactly what we’ve found in Coo Palace and the fantastic region of Dumfries and Galloway. But don’t take our word for it. This beautiful part of Scotland has been inspiring people’s creativity for centuries, not only for books and stories, but also making its presence known on the silver screen. 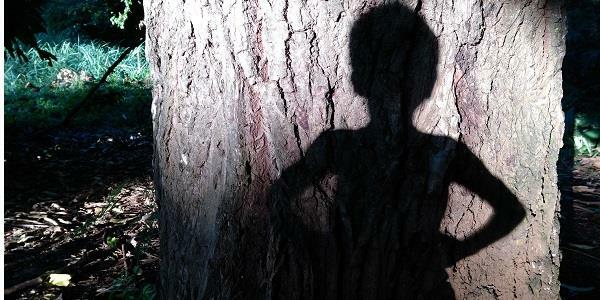 To start with, did you know that Dumfries contains the inspiration for the beloved tale of Peter Pan? Moat Brae is a property on George Street in Dumfries, built in 1823 and acknowledged by J.M Barrie as the inspiration for Neverland. Between the ages of 13 and 18, Barrie played games of pirates in the ‘enchanted land’ surrounding the grand Georgian house. The beautiful environment and memorable experiences strongly shaped his future writing career. Today the building is being restored into a visitor attraction and a national centre celebrating children’s literature and storytelling, including reinventing the magnificent garden as Neverland itself. Moat Brae will open to visitors in Spring 2019, containing interactive rooms, discovery garden, workshop and events, a family reading room and much more. Find more information on their website. Speaking of celebrated literary works, the famous Scottish poet Robert Burns, composer of ‘Auld Lang Syne’, was born in the village of Alloway in 1759, just under two hours from Coo Palace. In 1781 Burns went to nearby Irvine to learn flax dressing, where he also wrote his first poems. Today Alloway is the proud site of the Robert Burns Birthplace Museum, which contains over 5,000 Burns artefacts including his handwritten manuscripts. 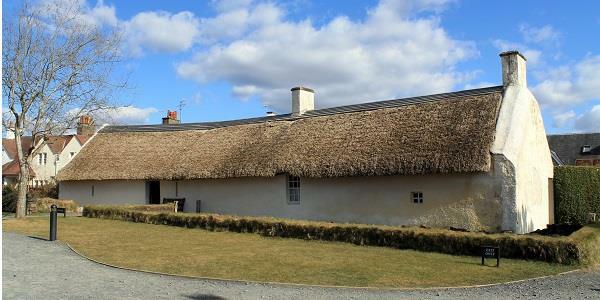 The museum leads visitors through a trail of historical sites, ending inside his birthplace, Burns Cottage. You can find more information on their website. As well as inspiring these famous works, Dumfries and Galloway has been used as a setting for several films and television series. It’s not surprising – with its undulating coastline of rugged cliffs and sandy beaches, as well as acres of lush forest and green spaces, the area has a wild and remote splendor. It's hard not to be swept away by its beauty. 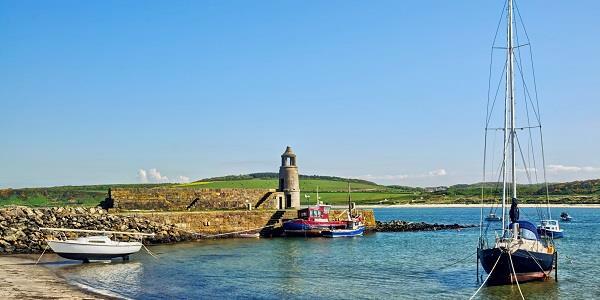 In 2000, the town of Port Logan, just over an hour from Coo Palace, was used as a filming location for the BBC TV drama, Two Thousand Acres of Sky. Famously, the cult classic ‘The Wicker Man’ was also filmed in the area surrounding Coo Palace, including several scenes that were shot within Kirkcudbright itself. These included the church that the main character attends in the opening scenes, the Post Office and Sweetshop. Many of these locations are more or less the same as they were back them, making them a real treat for movie lovers! Another classic film that was filmed around Dumfries and Galloway is ‘The Thirty Nine Steps’. In it, Robert Powell is framed for murder and flees to Scotland, where he spends time in both Kettleholm village and Morton Castle near Thornhill. More recently, ‘The Vanishing’, starring Gerald Butler, was filmed at a number of spots throughout Dumfries and Galloway in 2017 - the star caused quite a stir when he made an appearance in the local towns and villages. 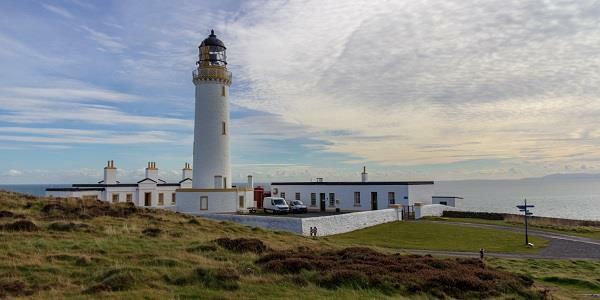 Killantringan, Mull of Galloway and Corsewall lighthouses were all featured in the film (all just over an hour from Coo Palace), which tells the true story of the unexplained disappearance of three lighthouse keepers more than 100 years ago. The wild, yet beautiful landscape provides a perfect backdrop, giving viewers with a breathtaking setting as they watch the drama unfold. From poets and authors to modern cinema, Dumfries and Galloway has been capturing people's imagination for centuries. This rugged and unspoilt piece of Scotland has some of the most dramatic stretches of coastline and countryside in the country, and you only need to spend a short time here to see why so many have fallen under its spell. Enjoy a break at Coo Palace, our latest property, and see for yourself! Learn more about Coo Palace here. To find out more about how to enjoy a holiday at one of our many properties, just get in touch with our expert team.